Every year, 2 out of 3 of my students got a Distinction for their O-Level Physics paper. Secondary 3. In fact, she failed. wanted to see Sherry pass Physics in O levels. 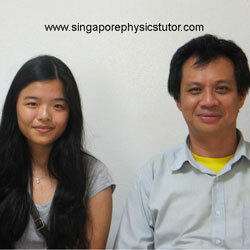 The first two months that Sherry attended Mr Goh’s Physics home tuition brought in surprises. Through the extra intensive lessons Mr Goh gave on top of the weekly group physics tuition, Sherry began to show interest in Physics. Her understanding towards the concepts of the subject also improved tremulously, which was noticed by both her school teacher and us. The rest is history. Sherry scored a distinction, beyond our wildest imaginations. Thank you Mr Goh for making the impossible possible! I would like to thank you for making the impossible to possible, within a span of 6 months, you bring Amos grade from C6 to A2. You are excellent! Thanks once again for Amos Ng excellent GCE O Level 2018 result, and he will be definitely able to enter his VJC with the 4 points. Thank you. I joined Mr Goh’s class during secondary 3 as I was doing very badly for physics. I had been getting Cs and could not understand the concepts fully. However, after Mr Goh patiently clarified all my misconceptions and doubts he has helped me attain an A2 for my O levels. Thank you Mr Goh for your dedication, patience and encouragement. My daughter was discouraged by her poor grades despite trying to study Physics. 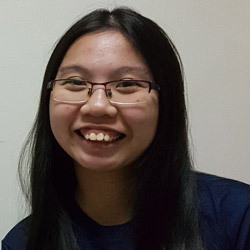 She even wanted to give up Physics for her prelims but thanks to your constant guidance, clear teaching and encouragement, she persevered and came to like the subject. She could always ask you any questions or clear her doubts anytime. Her confidence in grasping Physics grew. Thank you once again Mr Goh. I engaged Mr Gideon Goh’s help in November 2016 as I was struggling with my Pure Physics, obtaining a C6 in my most recent examinations at that time. Mr Gideon Goh is a charismatic teacher and has a long history in the teaching industry. His experience in teaching allows him to have a strong grasp of the Physics content and he is able to effectively bring across his teachings such that I had unbroken knowledge of the syllabus and understood what may or may not surface in my examinations. He yearns to see his students succeed and his dedication is evident as he goes beyond our physics tuition sessions by answering the innumerable questions I had asked him through Whatsapp over the course of the one year. It is only through his guidance was I able to sit through my ‘O’ Level Pure Physics Examination, with confidence, in November 2017 and achieve an “A1” grade. Ever since lower secondary, I found the concepts of Physics difficult to understand and tough to apply. Therefore, I have always been failing or just passing my school Physics examinations. However, after I have joined Mr Gideon Goh’s physics lessons, I started to understand the topics better due to Mr Goh’s detailed explanations. Mr Goh made relevant examples to enable me to visualise the problems better, thus giving me a better understanding of the topics. He also gave me a deeper understanding by emphasizing a lot on the fundamentals. Mr Goh also often cracked jokes to make the lesson more fun and interesting, which always made me look forward to his physics lessons every week. With Mr Goh’s constant encouragement and motivation, I saw improvements in my Physics grades, from a C6 when I first joined to an A1 in the O-level exam. 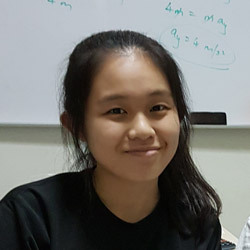 My daughter has been getting C6 for Physics since Sec 3 and seeing her struggle with the subject since lower secondary, I started to get worried for her Physics grades. I found Mr Gideon Goh online and decided to send her for his lessons. My daughter started to show a great improvement shortly after starting lessons with Mr Goh, earning a B3 in her next CA. My daughter also enjoyed his lessons, as she told me that Mr Goh does not only focus on academics, but also stresses the importance of other 21st century values and life skills. Eventually, she managed to get an A1 for her O-levels. Mr Goh managed to make her feel more confident in the Physics subject. I would highly recommend Mr Goh to other parents. 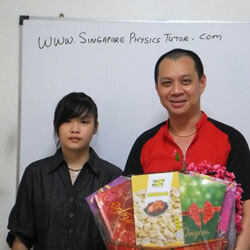 Mr Gideon Goh has been a great help to Nicholas in improving his Physics capabilities from the very start. His motivational & conscientious methods have helped to build Nicholas confidence in attempting Physics questions, which he did not have before. In addition, the engaging teaching pedagogy employed by Mr Goh was extremely effective in keeping Nicholas attention during the lesson & helping him to understand complex Physics concepts. I am thankful to Mr Goh for his high level of commitment in helping Nicholas to attain an A1 for his GCE O-Level examination. I wish him success in his pursuit to help & to nurture many more students in achieving their academic excellence. I am deeply impressed by the passion, enthusiasm and knowledge demonstrated by you during the first trial lesson in 2016. You are very patient and professional and has inspired Nicole to enjoy Physics, even though she has been asked by her Physics teacher to drop Pure Physics to do Combined Science. Not only did you encourage her not to drop Pure Physics, you helped boost her confidence by your fun loving ways in making lessons more interesting and easier to comprehend by being able to visualise the various concepts. Under your teaching, Nicole’s Physics grade has improved tremendously from a D7 to an A2. I am thankful to you and appreciate your professionalism, commitment and dedication. I started studying under Mr Gideon Goh before the start of my prelims exam. I have been failing my Combined Science Physics, getting a D7 or E8 before joining him. Mr Goh is a very patient and understanding teacher and I enjoyed attending his lessons. His explanations were very clear and detailed which gradually make me show more interest towards Physics ! After a few lessons with Mr Goh, my results had shown some improvement and I got a C6 during the prelims ! Nearing the O-Levels, Mr Goh would give us extra lessons ,encouraging me not to give up and he believed I would do well for my O-Levels. I finally managed to attain a B3 for Combined Science in my O-Levels, a grade that I have never obtained before ! My parents were very satisfied with my results. I am very grateful to have a teacher like Mr Gideon Goh ! I just graduated this year and frankly speaking, as a student who has had her lows with Physics in Sec 3,it was not easy trying to build my foundation in Sec 4. 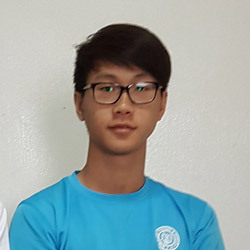 But thanks to Mr Gideon Goh, who very patiently helped me with the questions I was uncertain of and made sure I understood the concepts, O-Level Physics became a subject where I started to excel in and thus resulted in my newfound confidence in Physics. Hence, within a few months, I started to do much better for tests and ultimately secured an A2 for Physics in the O-Levels. I’ve had many previous Physics tutors before Mr Goh but I don’t think anyone could explain the way he did. His methods were always simple and easy to understand and it did changed my perspective towards the subject greatly. I am extremely grateful for Mr Goh’s kind guidance during this period ! As a parent, I was pretty worried about Priscilla’s Physics grades back in Sec 3. After chancing upon Mr Gideon Goh website, I decided to give it a try and I am truly impressed by his passion and excellent guidance. Within a short period, Priscilla’s grades had improved tremendously and I could see her significantly enjoying the subject rather than just trying to make it through. I’m a firm believer that her interest in O level Physics became a starting point to her improvement in the subject. She herself sings praises about Mr Goh’s teaching and as to how he has made concepts simpler to absorb and grasp and I’m thankful for Mr Goh’s guidance in sparking an initial interest in Priscilla in a subject she has been failing all these while. 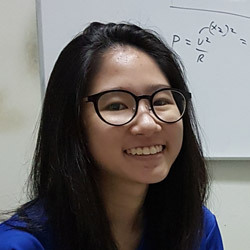 I am proud to say that she had scored an eventual distinction from an initial border line grade in the O-levels Physics with the help of Mr Goh. Thank you Mr Goh. My mother came across Mr Gideon Goh’s website in April 2017 – a time where I didn’t understand any Physics concepts my school teacher was teaching, and constantly failed my class tests. I resorted to blankly memorizing formulas and phrases, which proved to be of no help. When it seemed like I had hit rock bottom, my mother arranged for a trial lesson with Mr Goh. and used in real life. One very good example of this is during lessons, he would bring out gears in children’s toys or basic household electrical equipment to show the practical use of Electricity and Magnetism. He would use a bulb and a magnifying glass to show the difference between a real image and a virtual image. To enhance his students’ understanding of the different topics, he appeals to the sense of touch and sight – two of the five senses schools do not usually tap into. As a result, Mr Goh makes Physics intriguing and concepts easy to grasp. With something new to discover every lesson, I looked forward to attending his weekly classes. In addition, he kept close watch on my grades, congratulated me when I made progress, and encouraged me to strive for excellence. He always stressed this: Wherever you are, be the best that you can be. Not only did Mr Gideon Goh make Physics an adventure for me, but also a subject that I wanted to ace. After the first few lessons with him, I scored 19/20 for an MCQ class test in school, and went on to attain distinctions for my Mid-Year and Preliminary Examinations. I am very confident when I say that without him, I would never have been able to achieve such progress. Thank you, Mr Gideon Goh, for arousing Jonathan’s interest in Physics. I was at my wit’s end when Jonathan scored C6 at the end of Sec 3. I was frantically looking for a physics home tutor when I chanced upon your website. I read the testimonials with interest, but was highly skeptical about the vast improvement that some students achieved. Nonetheless, I sent Jonathan to you. I had only expected a B3 since it was less than a year to his O levels. 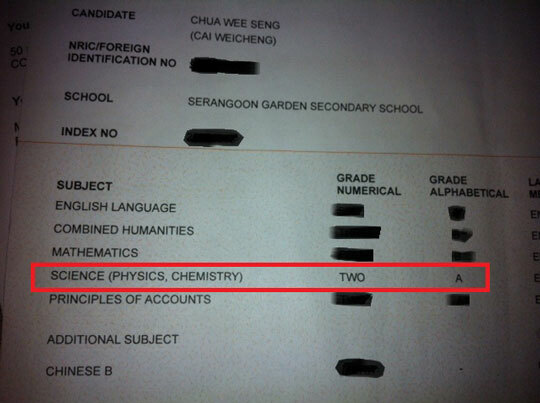 I was very surprised when he scored A1 for his O-Level Pure Physics. Jonathan told me that he scored well because he had enjoyed your teaching. In fact, he will be taking A-level Physics in the JC. I am so thankful for making the right decision to send him to you. Thank you, Mr Goh. I started studying under Mr Gideon Goh in the first quarter of 2016 where I would continue to learn Pure Physics until my O level examinations. Mr Goh is an engaging and respectful teacher with past experiences teaching with MOE and being an electrical engineer, will without a problem answer any question that you may have regarding the physics syllabus for O levels. Mr Goh does an excellent job at explaining, relaying key points and further elaborating on the topic so as to guarantee deep understanding into the topic at hand. He will not hesitate to answer any of your questions so do feel free to ask, he is also willing to handle your questions outside of class via Messaging in case you are in dire need of last minute pointers before your tests. Mr Goh has helped me in achieving an A1 for my Pure physics O level examination when previously I would score B3’s or a low A2. Without his guidance and teachings I would not have been able to score an A1 for my O’s. I graduated from Changkat Changi Secondary School in 2016 with a raw L1R5 score of 9 points and now currently studying in Temasek Junior College Science Stream. 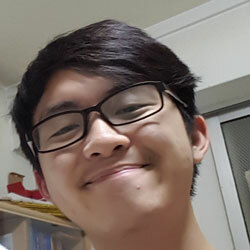 I highly recommend Mr Goh as your go to physics tutor in Singapore as he will make the subject that much more interesting and fun for you. Physics, to me, was a subject that I dislike and had no confidence in as I have always been failing in tests and examinations no matter how much hard work I put in. However, after joining Mr Gideon Goh’s lessons, which was very detailed and easy to understand, I started to like the subject better and was able to easily apply the concepts. Not only does he tries his best to make the lesson interesting and fun by letting us try hands on, he also ensures that we fully understand the topic before moving on. Moreover, he also encourages us to come earlier during examination periods so as to clarify all our doubts. Joining his home tuition with a D7, Mr Goh slowly helped me to gain confidence in the subject and eventually I attained a A2, a grade I never dreamt of getting in the ‘O’ level. I have never regretted joining Mr Goh’s physics home tuition and it was through his help and guidance that I was able to achieve it! My 2 children, Justin (2013) and Jesslin (2016), had Physics tuition with Mr Gideon Goh when they were in Secondary 3 and 4. We had a good experience with Mr Goh. Mr Goh has delivered good results as he has helped both my children to score A2 in their respective O levels. Mr Goh is responsive to provide feedback on the student’s progress. He also shared his opinions when we are in doubt on some decision that we had to make. He answered our queries and clarified doubts that we may have from time to time. I would definitely recommend Mr Goh to anyone seeking private O-level Physics tuition in Singapore. However, from April of 2015, I was introduced to Mr Gideon Goh’s tuition by my parent’s friend. That began the journey to success. Mr Goh had gone through every single topic I needed help, and with his explanations, it was very easy and logical to understand things more. With Mr Goh’s encouragement and urge to practice on exam papers, I found positive change in my results and later my attitude towards physics. In a span of less than 2 months, my physics grades had improved to a B4 and later in the prelims B3. Finally the A2 distinction came in O levels! In my opinion, Mr Gideon Goh is more than a private O-level Physics tutor; he was an inspirer who gave me the passion to do physics diligently and guided me in my life greatly. 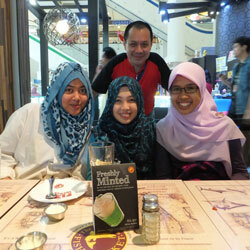 Truly one of the nicest physics tutors in Singapore I had been with! I would like to express my heartfelt THANK YOU to Mr. Gideon Goh for his concerted effort and diligent coaching to my son Matthias. My son has been getting C6 /D7 for his Physics in Sec 3. After taking private physics tuition with Mr. Goh in early last year, he has showed tremendous improvement from D7 to B3 in his Sec 4 prelim. When the result for O level results was released, we are so happy that he got A2 for the Physics. Just within a year he showed tremendous improvement. Thank you again Mr. Goh. We wish you great success in your teaching and we will definitely recommend your private Physics tuition should anyone requires your help. Mr Goh has helped in many ways during his lessons. In physics, he has clearly shown strong knowledge of the subject, in addition to the other many topics he covers. He not only teaches us to look within the boundaries of our syllabuses but also to look out of it, often explaining concepts no longer taught in the current syllabus. He is very willing to devote more attention and time on weaker students, drilling concepts with interesting and entertaining ways. Most of us students not only have a laugh (not aloud but in our heads, since some are trying to absorb information) but also able to understand the concepts clearly 1st time. He never shuns upon a student in need. He goes the extra mile as to provide extra free lessons on days he is free – given that arrangements are made beforehand – as an extra benefit in addition to the paid lessons. He is still young at heart, having a strong will and burning passion even though he has aged quite a bit. He is confident, but knows his limits. Furthermore, he has humility, and would still learn with us things he never knew. He respects students, and he is very keen to impart knowledge to those who wish to learn from him. From my perspective, his outlooks and demeanor has further taught me not to judge people just by appearances. He never dresses formally (like other tutors who wish to invoke a sense of professionalism), preferring to dress casually. He never use technology to teach, rather, approaching a more old-fashion sense of using the whiteboard and marker to draw and explain concepts. This subtle approach by him has achieved many results, with my classmates and me scoring nothing less than a B3. Personally I believe that it is clearer to absorb information and visualize the idea he wishes to convey to the students. His effort and devotion has helped me achieved an A2 grade in O-Levels. Though I am satisfied with my current grade, his teachings has made me realize that the grade I have is never perfect. He has that aura of determination and motivation to drive students onward in pursuing excellence when he teaches. Over time, I have opened more of my eyes into seeing the adult world, and discovering what I know is just a mere fraction of the world’s knowledge. Thus A grades are never enough with a test or examination. After all, this world is a vast library of knowledge and wisdom, and I personally believe, after meeting Mr Gideon Goh, that one of the goals of life would be to seek out this said knowledge and wisdom. Note : Isaac Tan continued one-to-one mentoring and coaching with me for his entire 3-year polytechnic course in Engineering Science. He scored A grades, A+ grades and A(Distinction) grades for all his subject modules in the polytechnic. His sister, Xavierlyn Tan, was also a student of mine and she also got an A2 for her O-Level Physics in 2013. Her testimonial can also be found on this webpage. Ever since I went to Mr Gideon Goh for physics home tuition, my grades kept improving. I was getting C5 for my physics, even until my first prelim. It was just around 2-3 months before O levels, when I visited Mr Goh. He helped me achieve A1 for my second prelim and eventually A2 for my O-Levels! Mr Gideon Goh has helped me greatly and his class is always super fun and enriching! He taught me shortcuts that were very applicable and saved me a lot of time during the exam. He also gave me a deeper understanding by emphasizing a lot on the fundamentals. Sometimes he will teach us other out of syllabus stuff that makes the lesson even more interesting. Go to Mr Goh when in doubt! My daughter has been getting C5/C6 for Physics since Sec Three. After getting C5 for 1st prelim exam, I started to get worried. I managed to find Mr Gideon Goh online through google and read some of his testimonials. 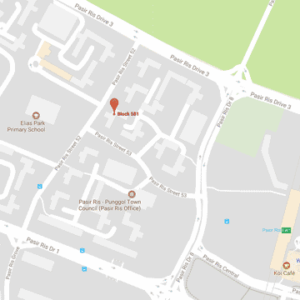 We lived in Bukit Batok and had to travel all the way to the “end of the world”- Pasir Ris for lesson. However, our efforts did not go to waste when my daughter achieved A1 for Physics in her second prelim exams. Eventually, she managed to get A2 for her O levels. Within a short 3 months of physics home tuition, Mr Goh was able to produce effective results. I would highly recommend this teacher to other parents. Thank God and thank you Gideon for guiding Joshua (our son) into achieving a good result for his O-Level Physics. When Joshua received his results at the end of secondary 3, we were worried because he had only managed to secure a C6 for Physics. We prayed and chanced upon Gideon Goh’s website. We contacted Gideon and decided to engage his tutorial service. Joshua had just received his O-Level result and we are joyful that Joshua managed to secure a B3 for Physics. 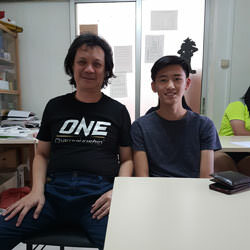 With Gideon’s teaching method that goes beyond just understanding the text, he has helped to stimulate Joshua’s thinking process, Joshua now has a better grasp in Physics that he is confident to pursue Physics for his A-Level education. We are grateful to Gideon for his guidance, not just in Joshua academia but also his mentoring of life experiences. We highly recommend Gideon Goh to any parents or students who needs help. Thank you once again, Gideon. Mr Gideon Goh is a very responsible and committed teacher. Under the guidance of Mr Goh, I was able to grasp Physics better. When I was stuck while solving physics problem, he would check through all workings thoroughly to identify and correct my mistakes. His explanations was clear and simple to understand. Mr Goh is a meticulous tutor who understands the strengths and weaknesses of each individual student and was able to provide coaching and guidance in the most beneficial way. He is also a caring tutor who shows concern about the student’s welfare. He was always willing to put in extra effort and time to help whenever I had difficulty, even if it was outside the official home tuition lesson timing. After being with Mr Goh for a year, my Physics grade improved from a C6 to B3. Before I joined Mr Gideon Goh’s lessons, I had always been failing Physics. My grades were at a constant D7, nothing more or less. Despite listening to lessons in class, I found it difficult to grasp basic concepts just by listening, confusing me even more than before. I was not scientifically inclined and I decided to give up on understanding Physics. Memorising seemed to the best way to tackle Physics and that was my very approach towards this very subject. At the end of Secondary 3, I had once again, gotten a D7. My worried mother immediately suggested I changed my tutor. Looking upon my results throughout the year, I decided that I indeed needed a change after all. I switched to Mr Goh’s weekly lesson during the year end holidays. Mr Goh’s classes were different from that of schools’. Unlike in school where the teachers had to cater to 40 students, Mr Goh’s classes had less than 8 students which made it easier for him to pick out your weak points and tell you where to improve on. His lessons were refreshing as instead of encouraging students to memorise like my school teachers did then, he explained everything in detail, repeating numerous times when you fail to grasp the first few times. He also offered free consultations nearing to exam dates to revise old topics. For the first time, I actually thought Physics was an interesting subject. I started to work hard for it, purchasing assessment books for further practice. My test grades rose to a B3-B4 grade and I had a deeper understanding of what I was learning. In addition, lessons are also not all about academic based. Mr Goh would sometimes teach us 21st century skills which were essential in today’s world, as well as narrate life stories with value. This further made lessons interesting as I learnt something beyond what was written in textbooks. Eventually, during my O Levels, I obtained an A2 grade for my Physics. This was all thanks to Mr Goh’s dedication and guidance throughout the year of lessons with him! Thank you Mr Goh for your guidance! All the best in your quest to help students ace their O-Level Physics! Note : Xavierlyn’s brother Isaac Tan joined my Physics tuition class the following year and he obtained an A2 in the O-levels. Isaac Tan continued having one-to-one private coaching with me for his entire 3-year Engineering Science course at Ngee Ann Polytechnic. Mr. Goh’s physics tuition lessons have definitely helped me to improve not only my physics grades, but also in other subjects. Not only is Mr. Goh very knowledgeable on what he is teaching, he is also able to pass down that very knowledge in a very clear and concise, easy-to-understand manner. Apart from his profound knowledge in physics, Mr. Goh also possess an infectious, positive and confident attitude, which has positively affected how I perceive problems I faced along my journey in Secondary School education. His never-say-die attitude has motivated me to become a better learner, as I felt more confident of myself and dared to make mistakes in a bid to learn. These life skills have helped me become a better learner, thus enabling me to score well in my other subjects too. His charismatic character, coupled with his expertise in physics makes him a very good tuition teacher. An experienced tutor, Mr. Goh is often able to point out common mistakes and misconceptions that students (sometimes even teachers!) make, and can correct them in a jiffy. In addition, as Mr. Goh was an engineer, he is able to effortlessly combine what students learnt with real-world mechanisms and phenomena, captivating the interests of his students by helping them understand that everything they learn is relevant, real and applicable in real life. Together with Mr. Goh’s guidance, I was able to improve from my C5 grade I had attained in the school examinations to an A2 distiction in the final O-Level Examinations. Mr Goh has always been a very encouraging and inspirational physics tuition teacher. Not only are his lessons fun and clear, he has a lot of patience and will revise certain chapters or concepts if you’re not familiar with them. Mr Goh has been a wonderful teacher for the past 2 years that he has taught me physics. He is not just a teacher but also, a friend and a mentor. He devotes his time to his students and always try his best to clarify his students’ doubts. He gives his all in ensuring that students reach their highest potential in physics. During the days nearing the O Levels, he held extra lessons and tried to help his students who are living around the Pasir Ris neighbourhood whenever he is free. His lessons are very engaging and I highly enjoyed attending them. I always find myself looking forward to Mr Goh’s Physics tuition on every Saturday. Gideon has helped my son, Nat, improve in Physics amazingly over the past 2 years under his tutorship. Nat’s come a long way from initially failing Physics in Sec 2 to achieving an A2 grade for his ‘O’ Level. Having to constantly struggle with passing my subjects, Secondary school has never been easy for me. I have always yearned to be like the students whom are meeting their targets and bettering their scores because I was very much the complete opposite. I’ve been failing so often that it came to a point whereby I thought I was never meant for Science. I hated the subject to the core. I dreaded Science lessons and looked forward to the end of lessons. I would sleep in class and was most of the time, oblivious to what my teacher was saying. The red marks on my report slip were like stains on a white shirt, I could scrub for days and nights but they would never come off…. and in Mr Gideon Goh, I found the solution to get rid of the red marks on my slip. He is a dedicated and humble man, who believes in instilling the love of Science; physics in particular to his students. My mom got to know about him through his website (www.singaporephysicstutor.com) and decided to contact him. Nothing has been the same ever since I started attending tuition classes conducted by Mr Goh. He gradually nurtured the love of Physics in me and from scoring F9s, I subsequently improved to a D7. During my prelims, I scored a B4 and it was only then, did I gain more confidence in myself for the upcoming O levels. Mr Goh’s physics lessons were more than learning of the applications and theories, he would always share with us his heart warming life stories and prepare us for the real world. He constantly motivated and believed in my ability to do well. With his unwavering support along with my family’s, I eventually scored an A2 for Science. This serves as a reminder to me and to anyone else, that if you put your heart into achieving something, your efforts will pay off. I couldn’t believe my eyes when I saw that my O-Level Physics result is an A2. It is definitely surprising since my prelims was only a C5; so I didn’t expect to earn a distinction. My great improvement can only come from my hard work guided by Mr Gideon Goh. Mr Goh has a one of a kind teaching methodology that ensures you comprehend the various Physics concepts well. He uses funny analogies for explanations and prepares challenging questions that guarantees a fruitful and enjoyable lesson. I wish to thank Mr Goh for all his patience and for believing in me. He has not only taught me Physics but also how to lead my life more effectively. I am proud to have worked with Mr Goh. Note : Justin’s sister Jesslin joined my Physics tuition class 2 years later. She studied under my coaching for her Sec 3 and Sec 4, and obtained an A2 for her Science. Before attending Mr Goh’s physics classes, I was unable to fully understand Physics concepts and did not like the subject. Therefore, I have always performed poorly in Physics, getting C5s or C6s for my Physics examinations. However, Mr Goh helped to clear my misconceptions about Physics and allowed me to learn about the subject in depth. Also, Mr Goh uses engaging teaching methods such as experiments to make learning fun and increased my interest in Physics. 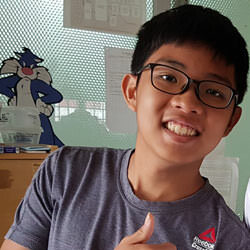 When the O-Level Physics examination was nearing, he also motivated the class and helped me to gain confidence in myself for the upcoming examination. Thanks to his guidance and help, I was able to improve tremendously and achieve an A2 for Physics in the O level examinations. Thank you so much Mr Goh! I was worried for my daughter’s Physics grades in school as she did not show interest in the subject and was not performing well. 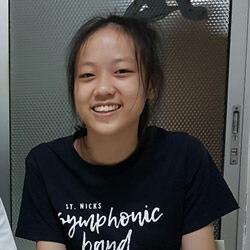 However, within 6 months of lessons with Mr Gideon Goh, she was able to fully understand physics concepts and I could see her improvement. I really appreciate the way in which you helped my daughter learn Physics which was one of the subjects she dreaded. 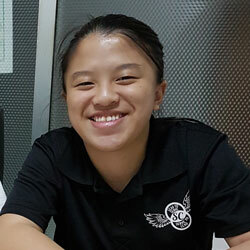 Through your interesting and helpful lessons, she has improved tremendously in this short period of time and achieved an A2 in the O level Physics examinations. Once again, thank you so much Mr Goh for teaching my daughter. I’d strongly recommend him to anyone who’s having difficulties in doing O-level Physics. Thank you Mr. Goh for your guidance and dedication. ? Mr. Goh has helped me make TREMENDOUS improvements in physics! I remember the first time when I came in for his lessons in Sec 4, I had neither confidence nor interest in physics because I failed all my physics exams in Sec 3, getting D7s. Since then, I have never failed any physics exams and finally got my A2 for pure physics at the O Levels. Mr. Goh has really helped me gain a lot of confidence with his motivating words every lesson and with that, I managed to gain interest in doing physics too. Currently, I am considering to continue with H2 Physics in JC. Nurul was getting D7 for her Physics before she knew you. After attending your Physics group tuition for only 2 months, she got an A1 for her latest Physics test. She told me about it and I’m very happy. She is very motivated now after attending your class and when she comes home after your tuition, I can see that she’s very happy and confident. I really appreciate your help and guidance. Thank you very much. I was barely a B student when I came to Mr. Gideon Goh. But within a short period of 2 months of tuition with Mr. Goh, I started to understand much more about Physics. Under Mr. Goh’s guidance, Physics became easier and scoring an A1 was not that tough anymore. I have achieved an A1 in the 2012 O-levels in Physics with his guidance. AWE-INSPIRING! This is how I would have described Mr. Gideon Goh. Unlike many other Physics teachers, he is able to explain every logic behind each formula with his infinite innovative, real-life demonstrations. For example, a floating toy car or a dollar coin to explain what exactly is inertia! On top of that, he is able to decipher “Refractive Index” for confused students like us, as most Physics teachers will refer to it as a mere “NUMBER”, which is of course not true! In terms of computer language, Mr. Goh is like a COMPRESSOR; he’s able to convert major topics like “Magnetism” or “Light” into 4 simple page notes and the result is evident. 2012 GCE ‘O’ Level : A2 for Comb. Sc. My daughter initially thought that she would be able to manage her Physics subject without any tuition. She tried hard but at the end of Sec.3, her C5 result had caused me to be worried and I told her that she should get help from a Physics tuition teacher. She was hesitant because she had bad experiences with class at tuition centre where the teacher usually cannot address her needs due to the large group of students. So I suggested private tuition. She agreed. Now I am faced with a problem. I heard many stories of challenging and bad experiences looking for private tutor via a third party. But no one that I knew had any recommendation for a private Physics tutor. Left with no choice I searched the internet, googled and started calling tutor by tutor, although I did not like the idea of doing it this way because to me it is like a gamble or trying my luck, which I do not believe. The searches were challenging due to limited number of Physics home tutors available as compared to Maths or Chemistry tutors. Then I bumped into Mr. Gideon Goh’s site. The first thing that I noticed was his long testimony of his teaching career and his photograph. These 2 things allowed me to know more about his personality as a teacher. Of course anyone could write anything. So I called him and talked and asked many things and felt that I should let my daughter have one trial lesson before really committing a decision. After the trial lesson, I asked my daughter her feedback and surprisingly, she said she liked the way Mr. Goh taught as it allowed her to understand many things that her school teacher did not explained. 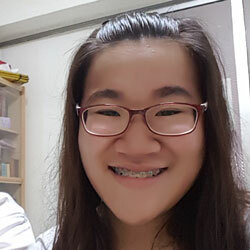 She told me that she would like to continue the physics home tuition with Mr. Goh but as she was a shy person she told me she would prefer the lesson within a group and not one to one. Thankfully, a few more Sec.4 students joined in the group but Mr. Goh kept the group small so that it was very conducive for lesson. She started her tuition in Dec’11 and by April’12, Sec.4 first term, I saw her grade improved although it was not dramatically. Still I am grateful as I know she was weak in her Physics and I would be quite satisfied if she just passed the subject. Meanwhile, Mr. Goh continued motivating her to study harder and evoke her understanding of the concepts. He would always open his door for my daughter or any of his students who need to come earlier when they need extra clarifications. Each time the lesson over, my daughter always gave me a very positive feedback about her physics home tuition, be it the lesson or how she interact with the other students. Mr. Goh was such a dedicated teacher and would not hesitate to coach the group extra lessons when the O level exam is approaching. He was really motivated by his love for teaching and wanted his students to be successful. I knew my daughter’s Physics grade has improved even before her O-level result was released. But when she told me she got A2 for her Physics, I just could not believe it! I kept reminding her that she could not achieve it without Mr. Goh’s coaching. She said she knew it and I am glad that she has personally expressed her gratitude to him. I certainly was glad that I made the right decision in engaging Mr. Gideon Goh as my daughter’s tutor. I would not hesitate to recommend him to anyone who needs a Physics tutor’s help. Thank You , Mr. Goh. Before I came to Mr. Gideon Goh for desperate help in Physics, I was ready to disregard Physics and just cross my fingers, hoping that I’d miraculously pass it for every test and examination. However, since going to Mr. Goh for private physics tuition, my grades have definitely improved by leaps and bounds. More importantly, Mr. Goh teaches in a way that cultivates passion in me for Physics. He ensures that I understand the basic concepts before moving on, and is always willing to sacrifice time before/after lesson to provide extra help for me. It is without doubt that I owe my A2 for Physics to Mr. Goh ? Thank You , Mr. Goh! Ever since I started Pure Physics in Secondary Three, I had trouble grasping the key concepts of the subject and many a time resorted to guessing answers during the examinations. I usually averaged around a B3-B4 grade. However, after joining Mr. Gideon Goh’s classes in April when I was in Secondary Four, my knowledge of and interest in the subject has steadily increased. Not only is Mr. Goh a good teacher, he also presents the key concepts in a unique way, which makes learning all the more fun. Thanks to all his effort and help, I was so happy to achieve an A1 for my end of year examinations, while clearly understanding the content I needed to know. Trust in Mr. Goh and all roads lead to an A1 ! Mr. Gideon Goh is a very fun and engaging teacher. His explanation and approach towards Physics is refreshing and easy to understand. Hi Mr. Goh, I have benefited tremendously from your interesting and enjoyable lessons. The detailed explanations that you provide have helped me to understand certain Physics concept better. Through your lively lessons, I have developed a keen interest in this subject. With your help, I managed to get an A2 for my “O” level pure Physics exam. You are a really wonderful tutor. Thank you. I find that your explanations are easy to understand and you also tend to reinforce important concepts which I find is great as I am not the kind of student who can grasp something in an instant. I am looking forward to future lessons with you. Thank you. You have been an awesome teacher. Your teaching style is very different from the other teachers. It was fun, and lessons were very interesting. Sharing of personal experiences and hands-on demonstrations helped to engage me better during your lessons. You have made a somewhat ‘boring’ subject into a lively one with your words and actions. I’m very thankful for all the help you gave me. From B4 To A1 in 3 Lessons! I got to know Mr. Gideon Goh from my good friend Jia Ru (see Jia Ru’s testimonial below). Before I got to know Mr. Goh, I got a B4 for my school’s Prelim 2 exams. I only had 3 tuition sessions with Mr. Goh and my O-level Pure Physics result was an A1. Just after ONE lesson of Physics tuition with Mr. Gideon Goh, I can already hear from my son the vital benefits of the tuition. He complained why hasn’t he known Mr. Goh earlier. In addition, I felt that my son had seen the light in Physics, not only as an exam-based subject, but how things worked in real life and how important Physics is in our daily living. Moreover, my son reassured me that his understanding for Physics is now so much stronger and clearer, after the few lessons with Mr. Goh. My mum got to know Mr. Gideon Goh giving Physics tuition from her search on the internet. I was getting C6 for my school’s Prelims 1 exams. After 4 lessons with Mr. Goh, I achieved A2 for my school’s Prelims 2 exams. In all, I only had 8 lessons with Mr. Gideon Goh before the O-levels. I got an A2 for my Pure Physics at the O-levels. Thank you Mr. Goh for your guidance and for helping me understand Physics better. I am now more confident to take on Physics in my higher education. My son showed little interest in Physics and placed his focus on other subjects. After a few lessons with Mr. Goh, he began to understand Physics better and even grew to love the subject. His Physics grade improved dramatically as shown in his school prelims. Thank you, Mr. Gideon Goh, for coaching my son Physics ! Good morning Gideon, after 2 lessons with you, Mandy had a Physics mock exam on 31st August 2011. It was the 2010 O-level Physics paper and she scored A1 for both Paper 1 and Paper 2. Thank you for helping Mandy to clear her doubts on this subject. Before knowing you, she got C5 for her Prelims 2. Have a great weekend. Thank you once again ! Among the many subjects that I took for my O-levels, Physics was the one subject that seemed to have an invisible barrier preventing me from getting an A-grade. That was until I engaged the services of Mr. Gideon Goh as my personal Physics tutor. My mum found Mr. Goh through the Internet at his website www.SingaporePhysicsTutor.com in early July 2010. In the short span of the few months that Mr. Goh tutored me, I found that I understood the concepts behind the various Physics laws and principles more clearly. Mr. Goh is very detailed and diligent in explaining the Physics concepts to me, ensuring that I understood them well so that when it comes to applying them to the O-level questions, I will be able to solve them correctly and confidently. I would like to thank Mr. Goh for helping me “break” the invisible barrier that has prevented me from getting an A-grade for my Physics. I managed to get an A1 for my school’s prelims and an A2 for the GCE 2010 O-level Physics paper. I wish Mr. Goh great success in his quest to help students in Singapore to do well for their O-level Physics. “F9 to A1 result is possible. of mine have achieved, call me TODAY!